A look at issues related to the illegal drug trade, 2015’s Sicario takes us to the US/Mexico border. Violence connected to these efforts increases, so authorities take action. FBI Agent Kate Macer (Emily Blunt) gets the gig to be part of a broad intervention. Along with a mysterious operative named Alejandro (Benicio Del Toro), she works the territory to flush out leaders. When did drug cartels become the Hot Topic of Choice in Hollywood? 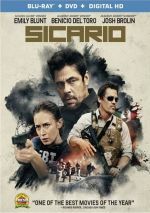 It seems like movie and TV screens abound with efforts along the lines of Sicario, and I’m not quite sure what prompted this renewed interest in the subject. Sicario stands as one of the best-received of the lot, as it boasts an excellent 92 percent on Rotten Tomatoes. It also received some Oscar buzz but ended up only with nominations in technical categories. Despite the synopsis I offer above, Sicario comes largely free from plot. Indeed, for most of the movie’s first half, it mainly follows an experiential path that lacks much in terms of obvious story material. This means Sicario places us in the action without a ton of context. Kate acts as the audience proxy to a large degree, as we dig into the seedy underbelly along with her, but that doesn’t mean the movie paints her as some babe in the woods. No, Kate offers an experienced operative, but her entry into the task force in which she participates becomes somewhat rough around the edges. The viewer needs to get acclimated to this new universe along with her, and this turns into an effective way to dig into the material. Blunt acts as a good tour guide. While she shows the general sense of off-kiltered feeling, she never comes across as soft or confused. Instead, she creates a strong, assertive center to the film who takes us on the journey. A terrific supporting cast helps, and in addition to Del Toro, we find talents like Josh Brolin, Daniel Kaluuya, Victor Garber and Jon Bernthal. All add depth to their roles, and Brolin fares especially well as the oddly nonchalant Agent of Uncertain Origin. Sicario acted as the springboard for director Denis Villeneuve to take on higher-profile sci-fi projects like Arrival and Blade Runner 2049, but I think he works best with his feet on the ground. As the leader of Sicario, Villeneuve doesn’t spoonfeed the viewer the various bits of information, but he keeps the material grounded. This means that despite the lack of clear exposition and the potential for confusion, the story always makes sense. Villeneuve manages to move the story ahead in a dynamic way while he doesn’t sacrifice development or narrative clarity, no small feat given the looseness of the basic tale. All of this adds up to a well-executed story of law enforcement and drug cartels. Taut and immersive, the movie hits on all cylinders. Sicario appears in an aspect ratio of approximately 2.40:1 on this Blu-ray Disc. The movie came with a high-quality presentation. Sharpness worked well at all times. Any softness remained negligible, so the movie came across as well-defined and precise. I noticed no signs of jagged edges or moiré effects, and edge haloes remained absent. The image also lacked any signs of source defects, so it stayed clean. In terms of palette, Sicario opted for a mix of teal and an arid, sandy impression. Though these hues didn’t light up the screen, they made sense for the material and came through as well-rendered. Blacks seemed dense and dark, whereas shadows looked smooth and clear. Everything about the image satisfied. Downconverted to Dolby TrueHD 7.1, the film’s Dolby Atmos soundtrack offered a strong affair as well. As expected, the movie’s action-oriented scenes fared best, as they used gunfire, aircraft, vehicles and explosions to fill the room in a compelling manner. The film’s pulsing score used the spectrum well, too, and quieter effects suited the story. These created a nice sense of place and acted to involve the viewer. Audio quality satisfied, with speech that appeared natural and concise. Music seemed full and rich, with crisp highs and deep bass. Effects followed suit and created dynamic material, as the various components showed fine range and impact. The movie used the audio well so this became a solid track. Four featurettes flesh out the set, and these start with Stepping Into Darkness. It runs 16 minutes, 46 seconds and offers notes from director Denis Villeneuve, writer Taylor Sheridan, director of photography Roger Deakins, production designer Patrice Vermette, storyboard artist Sam Hudecki, producers Molly Smith, Trent Luckinbill and Edward L. McDonnell, set decorator Jan Pascale, and actor Daniel Kaluuya. “Darkness” mainly looks at the film’s visual design and choices as well as locations and related topics. It covers the subject matter in an involving manner. With the 14-minute, 35-second Portraying the Characters, we hear from Kaluuya, Villeneuve, Luckinbill, Sheridan, Deakins, Smith, producer Basil Iwanyk, and actors Emily Blunt, Josh Brolin, and Benicio Del Toro. As expected, “Portraying” digs into cast, characters and performances. Some of this leans toward praise for the actors, but we get enough insights to carry us. Next comes A Pulse From the Desert, a six-minute, 19-second reel with Villeneuve and composer Johann Johannsson. “Pulse” examines the movie’s score, and it does so in a positive manner. Finally, Battle Zones goes for 13 minutes, 45 seconds and features Sheridan, Luckinbill, McDonnell, Villeneuve, Phoenix radio correspondent Monica Ortiz Uribe, journalist/author Diana Washington Valdez, reporter Daniel Borunda, photo editor Ruben R. Ramirez and Juarez Chamber of Commerce VP Jose Contreras. With “Battle”, we learn what inspired Sheridan to write the screenplay and we also get basics about the facts behind his fiction. “Battle” offers some useful information related to the real situations that inspired the film. The disc opens with ads for The Last Witch Hunter, The Hunger Games: Mockingjay Part 2, The Hurt Locker, Heist and Mississippi Grind. No trailer for Sicario appears here. A second disc provides a DVD copy of Sicario. It includes none of the Blu-ray’s extras. Though the genre threatens to wear out its welcome, Sicario offers a compelling view of the battle against drug cartels. Told in a loose but still involving manner, the movie digs its nails into the viewer and doesn’t let go. 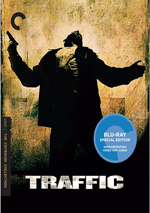 The Blu-ray boasts excellent picture and audio along with a small but informative set of supplements. Sicario stands as one of the best of its genre.